Welcome to our e-Safety section of the school’s website. The internet is a fantastic tool and used almost daily in our work, education and school lives. It is however relatively un policed. At SWD, we aim to provide children with the skills needed to be safe online, how to identify possible dangers and where to go for help if needed, so that they can play games and chat with friends. As a school we worked together to design a family of e-Safety animals linked to the different areas of e-safety . 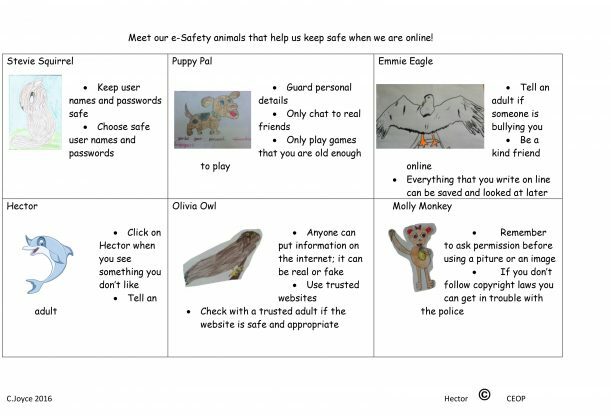 We use our e-Safety animals throughout the school whenever we use the internet and would like you to use these at home too. If you have any questions or worries please ask you class teacher or Mrs Joyce. Following on from our ‘Staying Safe Online’ parent’s workshop in July you asked for “more information on the different websites and apps that children are using “ and “ guidance on how screen time”. This year we will be running parent workshops focussing on this.